Even the most cursory glance will tell you that there is no shortage of beautifully proportioned 19th- and 20th-century architecture in Helsinki. Little wonder too that savvy hoteliers have long been spoilt for choice in scouting locations in which to open new outposts. 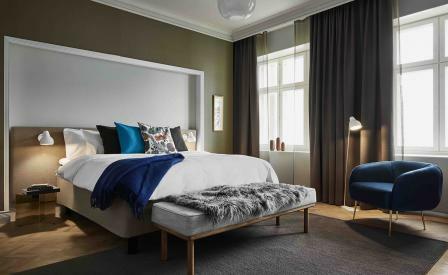 Like the Kämp Collection Hotels group whose latest venture, Hotel St George, is set in an imposing edifice built in the 1840s, but which wasn’t fully completed till 1890 by local architect Onni Tarjanne, who also worked on the Finnish National Theatre. A landmark in central Helsinki, the seven-storey building has now been restored into a sleek 153-room hotel. The interiors by Nordic Light and Mirkku Kullberg (the ex-CEO at Artek and head of the home department at Vitra) are dressed in a calm palette of pale olive hues, parquet floors, Santo Tomas marble tiles, and warm chocolate drapes, alongside modernist furniture such as Hjort af Örnäs armchairs and Finnish abstract art. The best room in the house is the third-floor St George Suite whose windows open out into Old Church Park. The hotel’s heart, though, is the Wintergarden Bar, awash with light streaming in through the glass roof, though the Finnish and Turkish executive chefs Antto Melasniemi and Mehmet Gürs certainly deserve some attention at the house restaurant Andrea.